Four years ago my good friend artist Nancy DeJesus offered to pick up some of her father’s filled chocolate Easter eggs for anyone who was interested. She was going to see her family out of state and could bring the eggs back with her. Since her father is a retired chocolatier and confectioner, I just couldn’t pass up the opportunity. I ordered some of the peanut butter-filled eggs and waited with anticipation to see how good they would be. I was not disappointed. The rich chocolate and creamy peanut butter filling inspired me to never go back to the mass-produced peanut butter eggs that you find in stores. Every year since then, I think about the eggs and wonder if I’ll get to order some of those creamy, chocolaty treats, but chance has not met opportunity. So this year I decided to take matters into my own hands and kitchen. Other than making Buckeyes and other simple chocolate candies at Christmas, I’ve never attempted couverture. I had much research ahead of me. I found a company that sells candy making supplies online, and they had a section on their website with instructions on how to make filled chocolate Easter eggs. The instructions included how to work with the chocolate and how to make several different fillings, including peanut butter, coconut, marshmallow, and cremes. My favorites are peanut butter and caramel, and my husband loves coconut, so I decided to make some of each. I’ve cut the peanut butter filling recipe in half because the original recipe makes such a large batch, enough to fill 3 dozen or more eggs, but you could even cut it in third. For the molds and dry fondant, I went to a local candy and cake supply store. Ghirardelli double chocolate and white chocolate make up the coatings for these eggs, although they are not technically couverture. It’s just what I happened to have on hand, although you could use Mercken’s or Guittard’s. Both are highly recommended for home cooks since they are easy to work with, and they are available in round 1 to 5 pound bags from cake and candy shops or online. Tempering chocolate can be tricky, but I found some easy-to-follow instructions online at Chocolate Affairs. Melting chocolate in the microwave and then seeding in the bowl is my preferred method. Someday I’ll be adventurous enough to try the marble slab method. I have a 2 foot by 3 foot marble-top table in my kitchen just waiting for me. Melt the white chocolate and fill the molds. Fill and top the white chocolate eggs. Melt the dark chocolate and fill the molds. Fill and top the dark chocolate eggs. At the end of the project I had made 48 filled chocolate eggs, enough to share with family and friends. Peanut butter and coconut fillings adapted from SugarCraft.com. Chocolate instructions adapted from Ghirardelli and Chocolate Affairs. Add butter and peanut butter to the stand mixer bowl and cream together. Add the fondant and salt and continue to mix on low. Pour in milk slowly and bring speed up to medium until well-blended and creamy. Refrigerate overnight in a sealed plastic bowl. Caramel Filling – See instructions for making Arequipe (dulce de leche). 1. In a small pan, heat the corn syrup until it is very hot. Do not boil! 2. Put the coconut into the mixing bowl and pour the hot corn syrup over the coconut. Stir to combine with a silicone spatula. Press wax paper on top of the mixture and let sit for about an hour so that the syrup saturates the coconut. 1. Cut 18 to 20 ounces of chocolate into small, uniform pieces and put into the glass bowl or measuring cup. 2. Microwave on 50% for 60 seconds. Stir and put back in microwave. 3. Continue to cook on 50% in 15 second increments. Take out and stir each time. You do not want the chocolate to melt completely in the microwave. There should be a few lumps that will melt during the final stir. 4. Temper – Add a few chunks of unmelted chocolate and stir for a minute or two. Remove the unmelted lumps and set them aside. They can be remelted and used again. Tip: Work with one flavor of chocolate at a time. Finish the eggs, then start on the next flavor of chocolate. 1. Pour the chocolate into each egg shape, about 3/4 full. Once you have filled one mold, gently tilt and rotate it so that chocolate goes to the top of each egg. 2. Over a clean sheet of wax paper, invert the mold holding it about an inch above the surface. The excess chocolate will drizzle out on the the wax paper. Hold this position for a minute or two, tilting as necessary. 3. Turn the mold back over and allow it to sit while you repeat with two other molds. As the chocolate sets up, use the small angled spatula to scrape any excess chocolate off the molds. Set aside these scrapings as they can be remelted and used for the final topping. 4. Allow the chocolate on the wax paper to cool, then scrape it off and put it back in the bowl. It can be remelted and used again. Note: You’ll have one mold of each filling flavor. 1. Add about 1 rounded teaspoon of coconut filling to one mold of eggs. Top with final layer of chocolate. 2. Prep plastic bags with #12 tips and couplers. 3. Add 1 cup of arequipe to a bag with the #12 tip. Take another mold and pipe about 1 teaspoon into each egg. 4. Add 1 cup of peanut butter filling to the other bag with the #12 tip. Take the third mold and pipe about 1 teaspoon into each egg. 5. Using a soup spoon, pour a little chocolate on top of each egg and spread chocolate around gently to seal. Finish all three molds. 6. Put the eggs into the freezer for 10 to 15 minutes. 7. Remove and invert over a tea towel, holding it close to the surface. You can work the molds like an ice cube tray, twisting so that the eggs come out easily. Use a soup spoon to move the eggs to a plate. 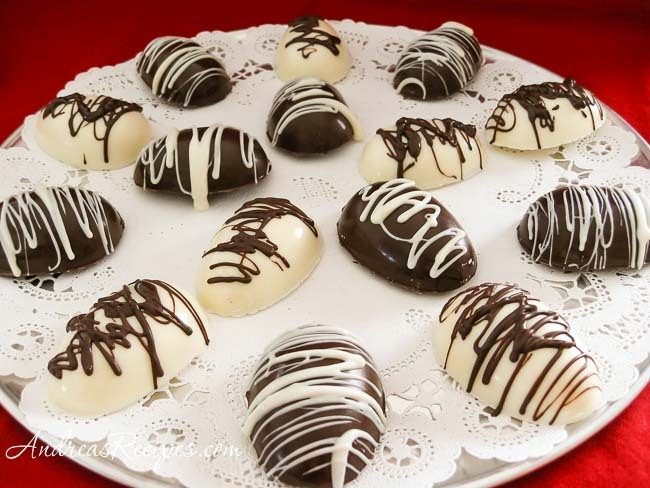 Avoid touching the eggs with your fingers because you’ll leave fingerprints on the chocolate. 8. 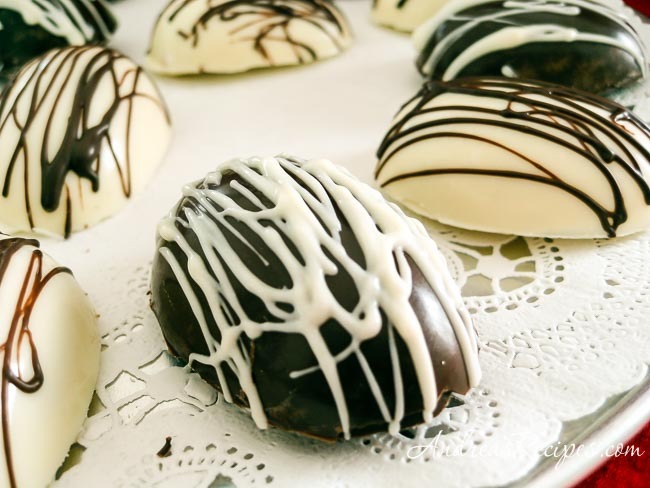 Decorate the eggs with drizzles of the other flavor of chocolate. Remelt the chocolate as necessary. It drizzles easier when full melted. Get some chocolate on the end of a knife and drizzle over the eggs in a zigzag motion, or in the design of your choice. You can skip the tempering step if you use a special coating chocolate such as Merckens or Guittard. I managed to make the eggs with fewer molds and just one glass measuring cup, but I had to wash up the equipment before moving on to the dark chocolate. Next time I’ll use six molds and the extra measuring cup to shorten the work time. You can buy caramel filling rather than making your own. Peter’s makes a soft, creamy filling that works well, and you can order it from various online companies mentioned in the Resources list. You can also buy peanut butter and coconut fillings. Check out the various online companies mentioned in the Resources list. I tried to make the coconut filling with regular sweetened flaked coconut, but the results were less than satisfactory. Because the sweetened flaked coconut is already moist, the syrup does not absorb into the coconut and tends to puddle. Stick with dry macaroon coconut for candy making, or try a recipe that uses regular flake coconut and evaporated milk. The texture is different, but still good. yum, andrea! this recipe looks fantastic! were doing the chocolate thing here for Christmas, its been since i was a kid the last time my mom did this and i wanted to brush up on it now that im an adult… very helpful, thanks. I keep having the same problem with the peanut butter filling! The taste is fantastic, as is the texture, but when I put it aside to ripen and check on it the following day there is a layer of oil (I am assuming it is the butter) sitting on top. When I fill my molds with this cream, and remove the finished eggs, they start to get oily on the bottom (the butter is still separating and is now leaking through the chocolate shell.) I have tried storing it with a paper towel sitting directly on top to absorb the oil separation, but there is still seepage through the bottom of the finished egg. Any thoughts on how to stop this from happening?